As far as hobbies go, picking up litter can be done on the cheap. Gloves, some plastic bags, and a bit of gumption will go a long way. If bending over all the time isn't your style, Mr. Litterman also recommends the use of a Nifty Nabber. What else could an avid litter-getter possibly need? Quite often, I sit down and search the Internet looking for articles on litter and have just found your web site, Citizens Against Litter. I have found it to be very interesting, inspirational and informative. I admire you for what you are doing. My husband, Ray, and I are also long time litter-getters. We pick up litter while getting our walking exercise, keeping 3 miles of roadside clean. I love picking up litter but getting others excited about it is the hardest task I have ever tackled. I agree with you that picking up litter once every few weeks or months does not eliminate the problem. Ray and I use a reach extender and a device to hold the bag open when we pick up litter. Reach extenders are readily available but bag holders are hard to find. Several years ago, Ray came up with an idea. We have been using it for four years and to us it is a necessity. It makes picking up litter much easier especially on a breezy day. With a reach extender and bag on a bag holder, you can walk, grab the trash, put it into the bag and not even break your stride. That's fun! We found all of these materials at Home Depot for about $5. Insert the aluminum rod into the vinyl tubing. A quick way to do this is with the use of an air compressor. Blow air into the tubing while someone else pushes the rod into the tubing. Don't turn the rod loose though as it will shoot out like an arrow. Press the rod up into the tubing about ½" so the tubing will overlap the sharp ends of the rod. 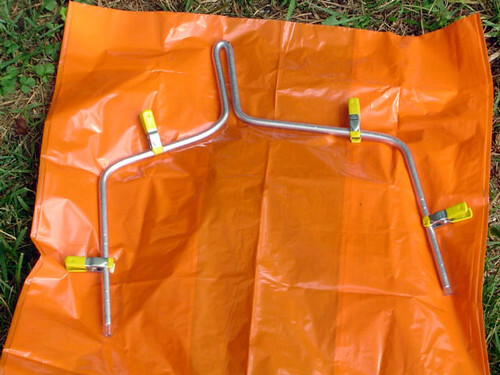 The tubing gives the clamps grip and makes the holder more comfortable to handle. Using a vice, bend the rod in the middle. Come down approximately 4" and bend to the right and to the left. Then bend down 7" from the tips. We shaped it like this so it will fit most any size bag. The handle is necessary as it aids in controlling the opening and closing of the bag. It also serves as a brace which makes the holder strong and durable. To put the bag on the holder, overlap 3-5" of the top of the bag over the rod. Cuff the part of the bag that is not attached to the holder. Clamp the bag to the holder as shown in the picture. You can use the full opening of the bag or make the opening small by gathering the bag at the handle. Wrap the excess around the rod. Using the 4 clamps, clamp at top and at tips of the rod. We don't have any problem with the clamps coming off if they are put on tightly. The entire setup is very light -- only six ounces. 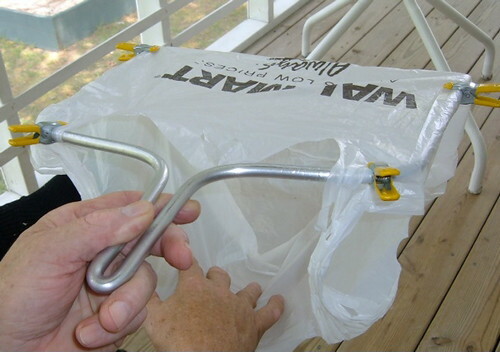 To put a small shopping bag on the holder, put the rod down into the bag and stretch the back of the bag over the holder and clamp into place. This works well for picking up a small amount of litter. You can put two bags on the holder by attaching a bag to the back of the holder using the same clamps. When doing my daily walks, I put 2 Wal-Mart bags on the holder and put trash in one and recyclables in the other [That's the spirit! -Ed]. I always take extras bags with me including a large trash bag just in case I run into a more litter than expected. Then, all I have to do is switch to the large bag.